In July, prepays moved back up toward 8% after one month near 7%. Increases in both the default element (CDR) and voluntary prepayment portion (CRR) caused the rise last month. Defaults rose by 58% after an identical percentage decrease in June, but stayed below CDR 2% for the 23rd month in a row. Historically, this reading was the 6th lowest on record. As for voluntary prepayments, they rose by 7%, staying below CRR 7% for the second month in a row. Turning to the details, overall prepayments rose by 12% to 7.90% from 7.06% the previous month. In comparing YOY prepayment speeds for this year versus last year, we see that 2015 is currently 0.02% higher than 2014, CPR 7.549% versus CPR 7.547%. As for the largest sector of the market, 20+ years to maturity, prepayment speeds rose by 10% to 7.62% from 6.96%. 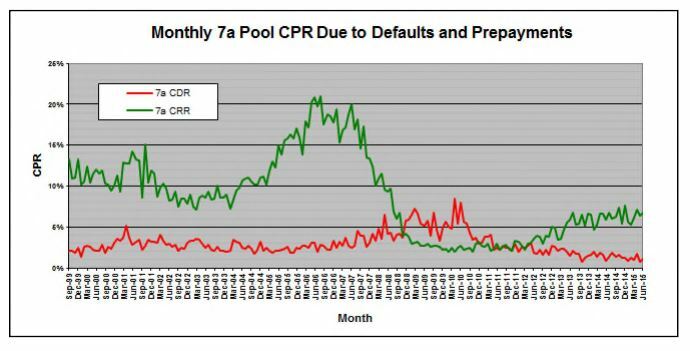 Turning to the CPR breakdown, the CDR increased by 58% to 1.11% and the CRR rose by 7% to 6.79%. Preliminary data for next month suggests that prepayments will continue to move higher and crest 8% for the first time since May. Regarding our maturity buckets, prepayment speeds rose in five out of six categories. Increases were seen, by order of magnitude, in the 13-16 year sector (+235% to CPR 11.34%), 16-20 (+62% to CPR 8.73%), 8-10 (+36% to CPR 10.24%), 20+ (+10% to CPR 7.62%) and 10-13 (+2% to CPR 7.82%). The lone decrease was seen in <8, which fell by 2% to CPR 11.31%. For the first time this year, the YTD prepayment speed surpassed 2014. I would expect to see this year continue distancing itself from last year as prepayments rise.